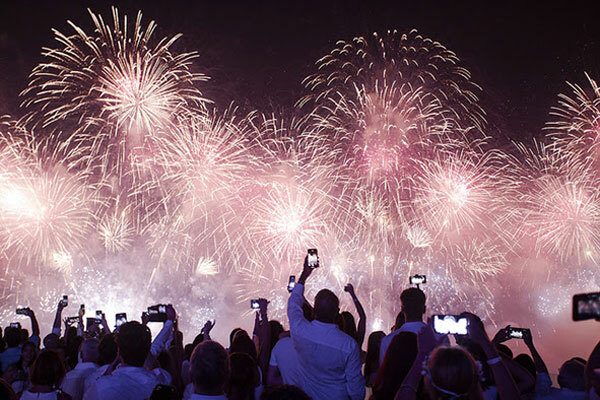 For the first time in history, the New Year’s Eve celebration held at Copacabana Beach, in the Southern Zone of Rio de Janeiro, had more tourists than residents in the metropolitan area. The celebration — over 10 hours of concerts and 14 minutes of a firework display – gathered 2.8 million people, with 1.4 million tourists. The data are part of a survey conducted by Riotur — a company linked to the city hall, responsible for promoting tourism — on the night of Dec. 31. Of the total number of visitors, 155,000 were foreigners and 1,245 from other parts of Brazil. The survey, which interviewed 303 people aged 18 to 55, revealed that Argentine, Chilean, Bolivian, American and Portuguese were the most common nationalities among tourists in Rio’s New Year’s Eve party. On average, each foreigner spent R$2,250 per day and stayed seven days in the city. Among Brazilians, most came from São Paulo, Minas Gerais and the Federal District. The average expenditure per day was R$1,500.00 and the average length of stay was five days. In Riotur’s assessment, the figures reveal how the city’s New Year’s Eve has a vocation for tourism and consolidate the event as a tourist landmark of the Marvelous City. “The city had record hotel occupancy. It was a superlative New Year’s Eve, as Rio deserves,” celebrated Marcelo Alves, president of Riotur. Eight other stages, scattered across the city, also had concerts and firework displays. The celebration at Flamengo, also in the Southern Zone, was attended by 650,000 people. In the Northern Zone, Ramos gathered 40,000 people; Madureira Park gathered 35,000; Ilha do Governador, 12,000; and Penha, 10,000. In the Western zone, 6,000 saw 2019 arrive at Guaratiba. Another 15,000 were at Sepetiba. 4,000 people celebrated in Paquetá, an island in Guanabara Bay. According to the latest survey conducted by the Brazilian Hotel Industry Association in Rio de Janeiro, the average occupancy rate in the city for the New Year’s Eve exceeded 98%, higher than the number recorded in the same period last year. The largest demand was concentrated in the Flamengo and Botafogo regions, with 100% occupancy, followed by Copacabana, Leme and the City Center, with 98%, and Ipanema, Leblon, São Conrado and Barra with 97%. In the countryside, 93% of the rooms were occupied.